Updated 3/22/2017 to add some missing text. This is not technically a “Beyond Racer Road” story, but I think it fits right in. The previous BBR articles, with one exception, were about developing a Ducati onto a winning Superbike racer. This is about developing a BMW into a winning Superbike racer. 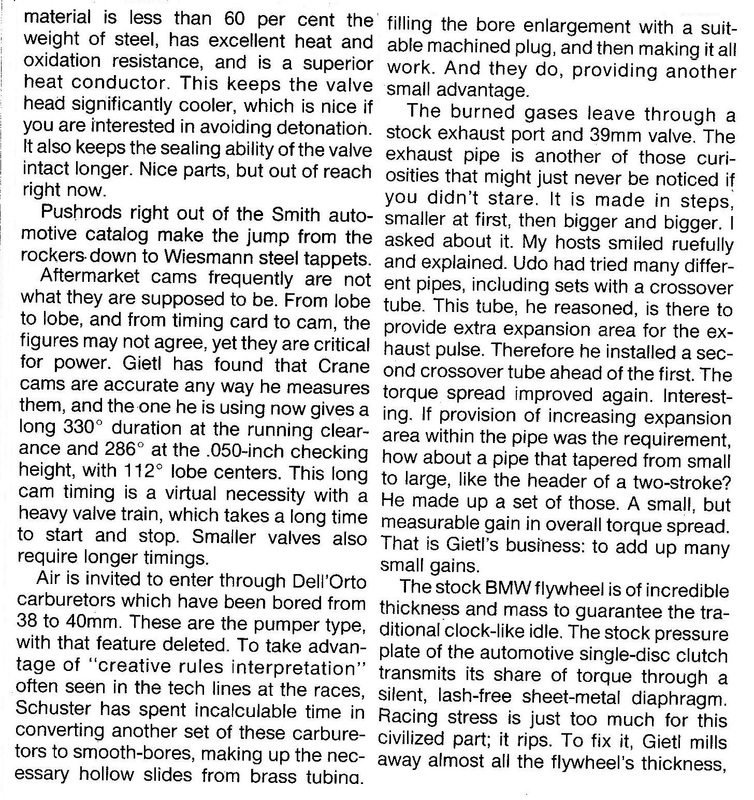 This article was originally published in the March 1979 issue of Cycle magazine, republished here with permission of the author. A very interesting point is, that bike with rider John Long, could easily have been the 1978 AMA Superbike champion. A one lap penalty at the Fall Loudon race dropped him from 3rd to 11th, lowering his point collection from that race by 9 points, 13 to 4. At the end of the season Long and Reg Pridmore were tied with 54 points each. Neither rider had a win, but Reg had two 2nd place finishes to John’s one, so Pridmore was the 1978 AMA Superbike champion. Somehow that two cylinder, push-rod twin was kept competitive far longer than anyone expected. This article explains how. As usual for a Kevin Cameron article, there is a lot of technical information here. For reference, here are links to the other Beyond Racer Road articles. BBR1 – The Toe Gets Dipped. BBR2 – Learning the Craft. 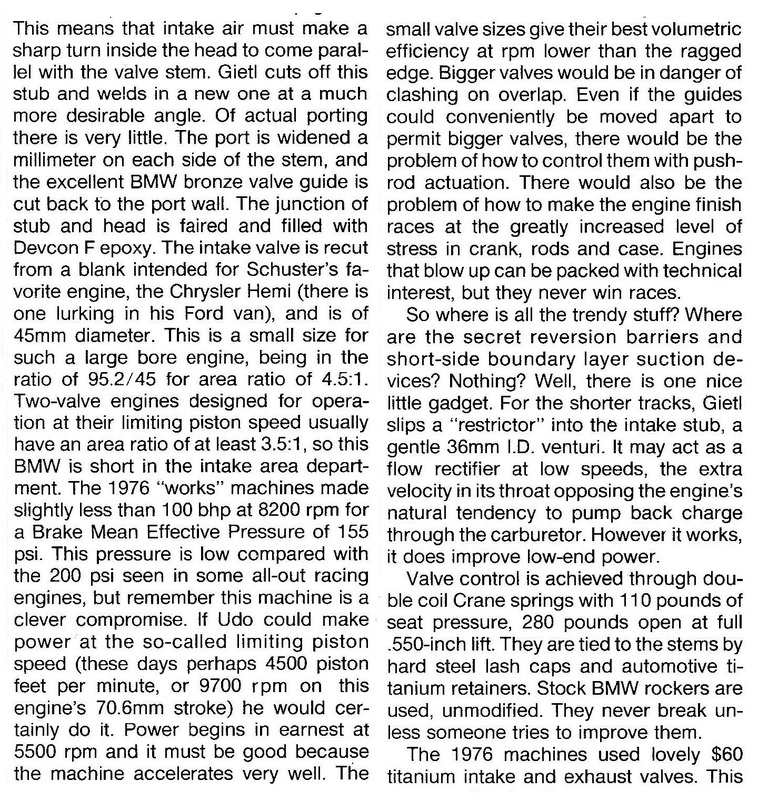 BBR4 – A Square 4 Two-Stroke. BBR5 – the Hot Rod is Born. BBR6 – Dark Secrets Revealed.